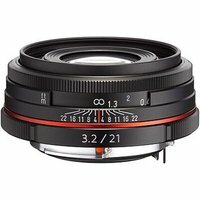 The Pentax 21mm f3.2 AL Limited Lens Black is a wide-angle lens designed specifically for use with digital SLR cameras that feature a Pentax K-mount. This Pentax 21mm f3.2 lens incorporates an aspheric lens element for crystal clear image quality, whilst the high-grade aluminium lens barrel ensures the lens is compact, lightweight, but robust. This ultra-slim lens is ideal for capturing landscapes, cityscapes, interior shots, night scenes, group shots and more. Being part of the Pentax Limited range, the 21mm f3.2 AL lens inherits a well-constructed aluminium body, exceptional image quality, High Definition (HD) coating and a round-shaped diaphragm for a beautiful bokeh (out-of-focus) effect.